I'm running Kodi 17.6 on Windows 10 PC. I've got a drive location where I've set up my movie library. I can browse to it and I see the directories and the movies there. If I click on the movies in question, I can open and view them with my local default player, no problem. Oh, I'm using Confluence as my Interface Skin. I have it set up to view hidden directories and also file rename and dele. My library is set to update on startup. If I open my library to view it, I can see two particular movies that I have there. In fact, if I go from the main skin menu to Videos, Library, I can see the movies there. I can click on them and they play on the Kodi player, also no problem. Here's what confuses me: If I go from the main skin menu to Movies, those two movies don't show up in the movies list at all. In addition to being in my Library, they show up in the Videos, Files list, and I can click and play them there as well. I can't figure out for the life of me why they're not on the Movies list and I can't play them there. I like the Movies interface because I can easily open the movie Information, play trailers, view cast, other information, and set my own ratings. You know what would be really nice? If I could type in a little note on my personal review or comments about the movies. It would be nice if I could also do this with Actors and Directors under the Movies section on the main menu. OK, and how about this? I've noticed that sometimes, especially with foreign movies, database thumbnails and information will not match the movie. For example, there are a lot of movies named Tunnel, or The Tunnel from US and foreign countries. You don't seem to have any option which movie it is that is in your library. It will of course play your movie, but the thumbnail and information is wrong. Anybody know how I can fix or get around that? (2019-03-03, 19:23)silvanet Wrote: [ -> ] 've noticed that sometimes, especially with foreign movies, database thumbnails and information will not match the movie. (2019-03-03, 19:23)silvanet Wrote: [ -> ] if I go from the main skin menu to Videos, Library, I can see the movies there. 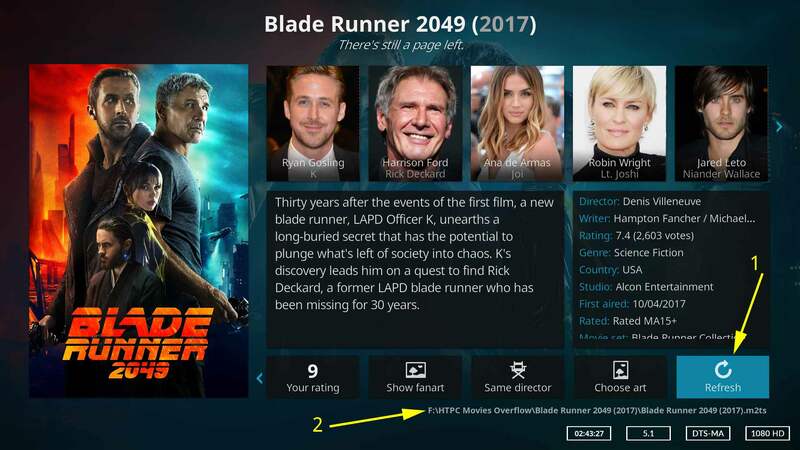 Main Menu>Movies = Is library mode and movies need to be scanned/scraped into the database to see them. Your two movies are not in the library. Most likely due to incorrect naming.